Stage Show Excerpt - The Amazing Suit Jacket Escape! Anthony Lindan is a master magician, performer, team builder, custom creator and lecturer of close up magic as well as a gifted and engaging stage illusionist and mentalist. 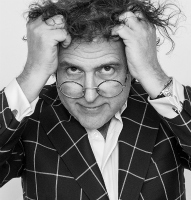 Based in southern Ontario (Canada), Anthony has for more than 25 years performed exclusively for corporate functions such as receptions, conventions, conferences, trade shows, hospitality suites, sales meetings and at numerous prestigious events requiring the finest in blue chip entertainment. Lindan’s keynote presentations and workshops share practical tips about tapping into your inner magic, maximizing your personal impact and communicating more confidently and effectively. 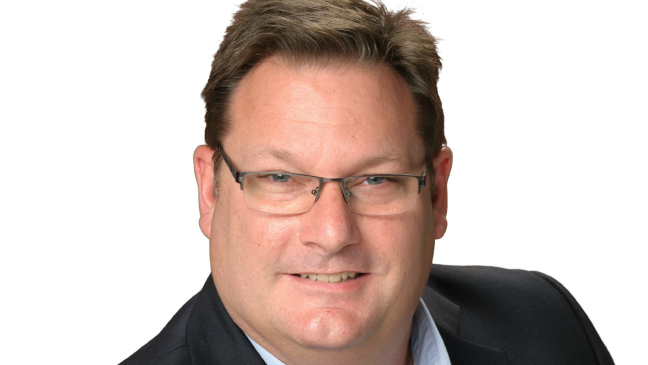 Anthony Lindan has combined his unique experience as a corporate trainer and entertainer to create a fun and engaging team building activity – The Magic of Collaboration – that delivers valuable learning outcomes. Your team creates and performs a Las Vegas Style variety show. Each act is scored by a panel of celebrity judges and the highest score wins the grand prize. Although not a million dollar contract or the prestigious Mirror Ball trophy, the winners do get bragging rights in the office! It`s friendly competition where your team members are the STARS of the show! Everyone is a winner as participants experience the direct benefits of collaborating to achieve results! Your group is divided into small teams and each team acts an award winning Hollywood production team. It’s show time! Each team takes the stage and performs their act. It`s all about achieving results so after the thunderous applause a panel of celebrity judges ( for example, Lady Gaga, David Hasslehoff and Simon Cowl played by three of your people) score each performance. The team with the highest score wins the grand prize! 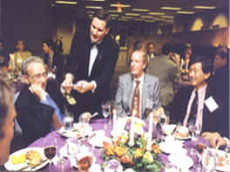 The Magic of Collaboration team building activity is a complete turnkey program and Anthony Lindan provides all required learning materials and props. It requires a simple room set up. He's delivered the program in board rooms, hotel meeting rooms, client function rooms and even outdoors! NO fancy lighting, decor or stage is required. About the judging… it’s a FUN competition that emphasizes the importance of working together to achieve results. Three of your people play the part of celebrity judges.The judge’s responses are equally as anticipated and entertaining as the performances! Don’t worry, we provide the costumes and character profile briefing sheets for each judge.The client determines how many prizes are to be awarded and supplies the prizes. The variety show concept is an interactive, non-threatening and non-physically challenging medium. Everyone can participate and the activity draws on a diversity of skills and thrives on cross pollination and personal buy in. Teams can straddle departments, age, gender, job titles, seniority, skill sets and learning styles. Crossing silos allows your employees to truly appreciate and experience the diverse perspectives that contribute to your organization’s ultimate success. 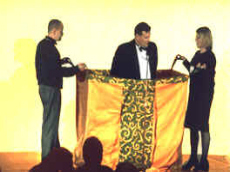 Each team is assigned a simple and easy to perform magic trick and given a progression of defined tasks that culminates in a performance on stage. Not everyone has to go on stage. Three quarters of the work is behind the scenes. Participants negotiate within the teams for roles that are in line with their natural strengths and talents. Working from a strong foundation promotes personal buy in of the entire collaborative process and strengthens the link between attitude, working together and achieving results. Teams have fun working hard and smart taking calculated risks in a truly collaborative experience. Empowered players build strong teams that create amazing results. The creative finger prints of each team player are integral ingredients in defining the ultimate success of the stage performance. to have a whole lot of fun in the process! Many occasions call for nothing more complicated than a really good show which is exactly what the Pure Entertainment program offers in two magical versions. Both are lighthearted celebrations of fun and goodwill and each can be customized to carry your corporate message. Anthony takes care of the pre-performance details and his material is always in good taste so there's nothing to plan, do or worry about. 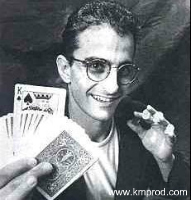 Now, we should mention that Anthony Lindan decidedly does not fit the usual stereotype of magician-performer. There are no pesky rabbits, no flighty doves and when it comes to costume, he favors well-tailored business suits (or black tie if the occasion calls for it) over Mandrake-the-Magician capes. Something of a chameleon, he tends to blend in ... until he starts to work. That's when the fun begins. Presence of Mind is a 30-40 minute, cabaret style, stage magic show designed for an audience of 25-500 people. With its focus on audience participation, it's ideal for banquets, award ceremonies, sales meetings, product launches, conventions and any event where people gather to have a good time! It's a fast-moving show and Lindan gets the audience into the act right from the start (pick a card, any card). He turns otherwise perfectly normal people into human slot machines (lots of spinning, silliness and laughter); gets the boss into the act; borrows money, makes it disappear and takes the audience on a complex series of misadventures to get it back. Before you know it, it's time for the grand finale -- the hilariously frustrating Houdini-style escape. Houdini was never like this! 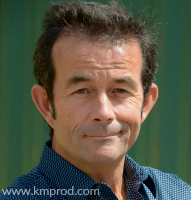 Anthony Lindan is represented by K&M Productions. For more information, fees & booking Anthony Lindan, contact us. The event was great and everyone enjoyed the session with Anthony. Thanks so much to K&M Productions for your assistance in planning our event. Anthony was great!!! He had everyone laughing, and his magic tricks made quite a few of us go "WOW...how did he do that????" 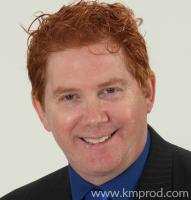 Thank you K&M Productions for suggesting Anthony - we were truly impressed with him. Everything went great with Anthony’s workshop! 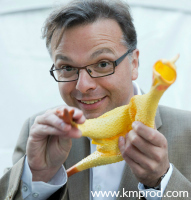 We found him to be very engaging and was most entertaining through his magic and his sense of humour. I had many people express their enjoyment of a team building activity that was so different than the typical things that have been done in the past. Our VP thoroughly enjoyed the workshop and how it tied perfectly in with the rest of our meeting's theme and content. Anthony has definitely created a unique and valuable program. I could tell all the groups were having a great time learning the tricks, and it was a riot watching them 'perform'. We had everyone in cross-functional teams, so it was a super opportunity for different people to work towards a specific outcome in a specific amount of time. I especially liked how the groups tied their presentation in with our Kraft Values. Anthony taught something very important when he explained that it’s not just about doing a trick, but that a story or message needs to be communicated while doing it. This definitely translates to our actions at work. Thanks to K&M Productions for working with me to secure Anthony for our meeting; it was a pleasure to work with you! The session with Anthony went very well. The team was very engaged and it tied in nicely to the theme that we were focusing on. I will definitely share the information with my HR colleagues for any future leadership/teambuilding sessions. The feedback we received on the team building workshop was really great! People really liked the approach and they took away interesting concepts from the event. Anthony also performed some really amazing card tricks during dinner and afterward which dazzled all. I would most certainly say the workshop itself was really worth it: very energetic, lots of participation, and I can now speak from experience that it is not easy to perform a magic trick in front of a crowd believing you will fool them! Please convey my sincere thanks again to Anthony. Thank you for your fine work at our 'Magic Box' product launch in New York. You helped make the event a big success. Your customized magic presentations effectively relayed our key messages and did so in an immensely entertaining yet unobtrusive manner. We hope you'll work your magic with us again in the future. Everyone enjoyed your magic and the SAS messages you integrated throughout your performance. You are a quick study. You know our SAS messages better than some of our own folks! Your customized magic performance was amazing and informative and helped us attract people to our booth. Our staff was particularly impressed with how well you incorporated our key product information into your magic presentations. You certainly did your homework about our company and products.